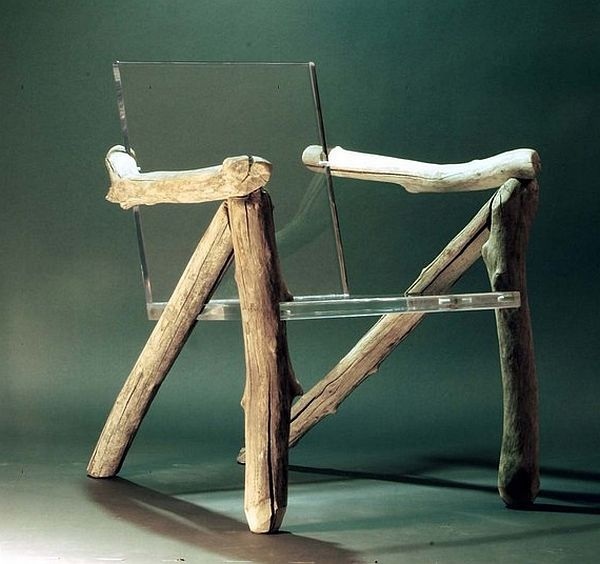 When it comes to acrylic furniture, one thing is clear: there is power in transparency! Clear acrylic is a thermoplastic with the look of glass and the useful benefit of shatter resistance. Durable and airy, this material sells under many names, including Lucite, Perspex, Plexiglas, and poly(methyl methacrylate), or PMMA. So why go clear? 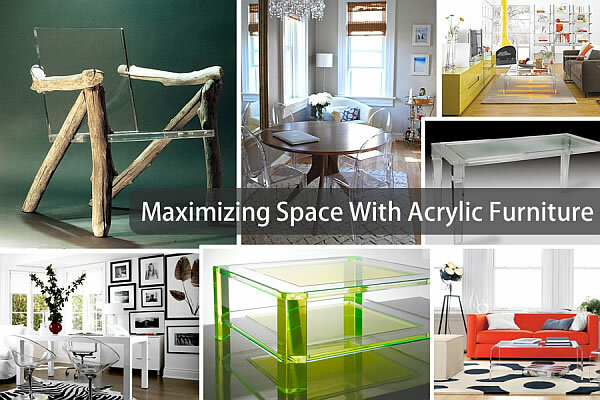 For one thing, the fact that you can see through clear acrylic furniture gives it the appearance of taking up little to no space, a helpful quality for small rooms in which maximizing space is a priority! Furthermore, its tendency to expose everything it holds forces a certain level of organization. For example, an opaque shelf that holds haphazardly stacked books and papers may not reveal as much of the mess as an acrylic shelf, the contents of which can be viewed from all angles. 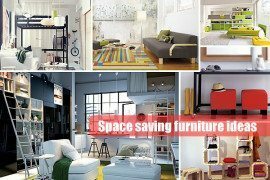 In other words, acrylic furniture encourages its owners to be neat, resulting in dwellings that are as tidy as they are stylish! 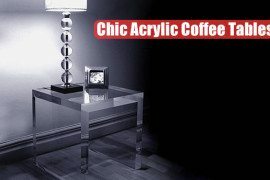 Acrylic coffee tables are ideal for tight spaces. 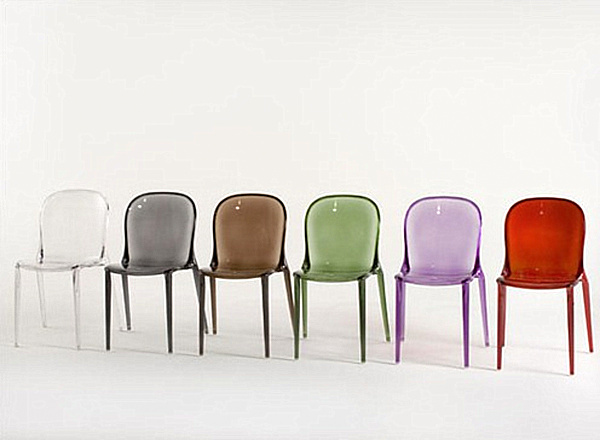 Not only do they appear to take up little room, their shine adds a sleek, glossy quality to interiors. In addition, these shiny pieces are perfect for rooms that showcase patterned rugs, as the colors and shapes from the floor show through the furniture. 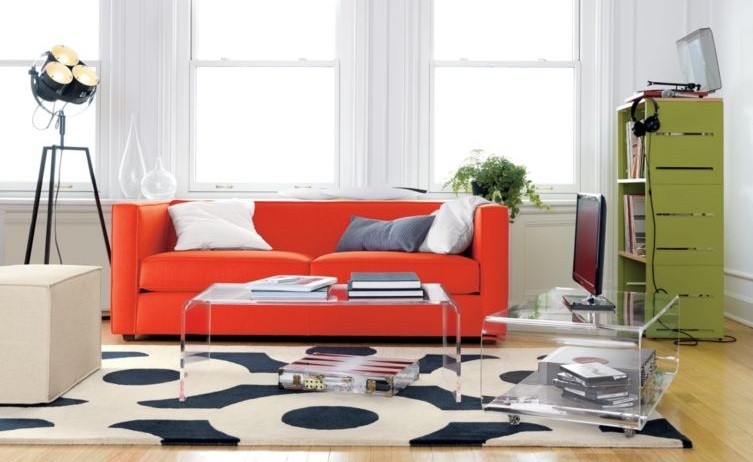 Below we see the classic yet modern design of the Peekaboo Clear Coffee Table from CB2. The Peekaboo Clear Media Table rests beside it. 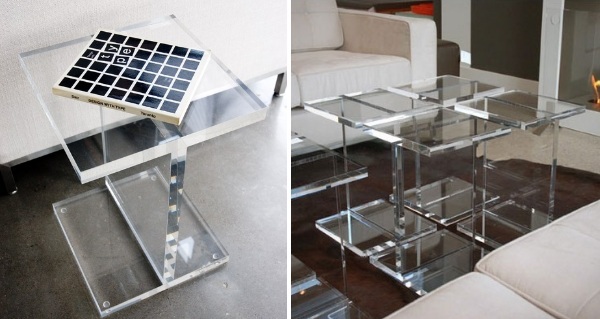 Another option for the Peekaboo Clear Coffee Table is stacking two side by side to create one piece. 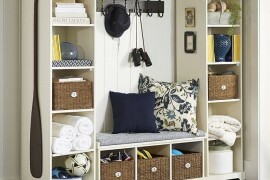 This alternative is perfect for rooms with longer lines and lean spaces. Next we have two stunning pieces from Alexandra Von Furstenberg, whose chic modern acrylic furniture designs have received much attention. 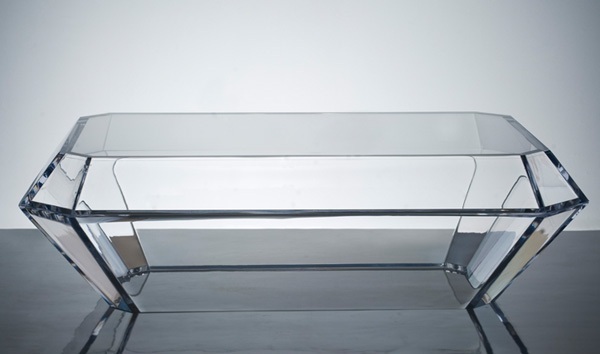 Below is the Bullet Acrylic Coffee Table, which was inspired by the designer’s love for emerald-cut diamonds. It can be ordered clear or with black detailing. 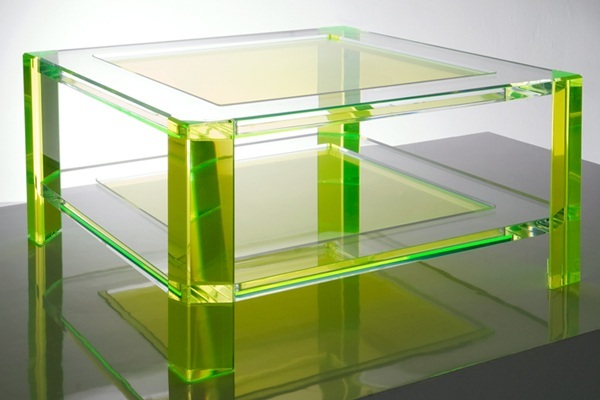 The green embellishments of the Radiant Acrylic Coffee Table introduce both clarity and color to a room. The piece is available in a range of hues and can be customized to fit larger or smaller spaces. 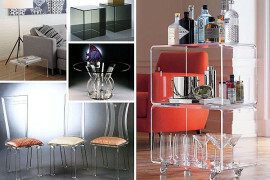 Transparent acrylic side tables are perfect for narrow spaces beside couches and chairs. Clear and compact, they are eye-catching with their icy presence, yet subtle in their appearance. 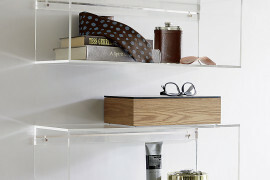 The Magazine End Table (below, left) may be small, but it stores items both above and below. The CUBE (below, right) is open for function and tinted for style. These pieces from HStudio are available in a range of colors. Next we have the Gus Modern Acrylic I-Beam Table, which makes a strong statement as a single unit, yet can be purchased in multiples and grouped to create a modern coffee table. This piece designed by David Podsiadlo is available through AllModern. Once again, Alexandra Von Furstenberg brings her acrylic magic into the mix! 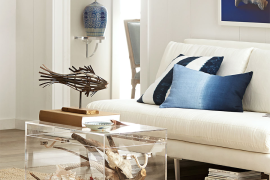 The vibrant edging on her pieces injects a dose of color, yet portions of the furniture remain perfectly transparent. The On The Rocks Acrylic Side Table (below, left) has a neon border and makes a great bedside table, as well as a living room showpiece. 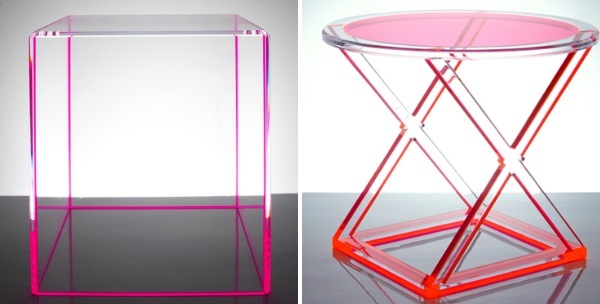 The XOXO Acrylic Occasional Table (below, right) wows with its “X” frame base stand and “O” top. As with most of Von Furstenberg’s pieces, these treasures come in a variety of colors. 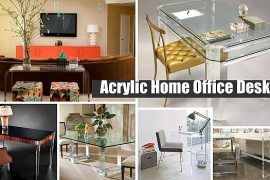 For a big statement, select an acrylic desk! 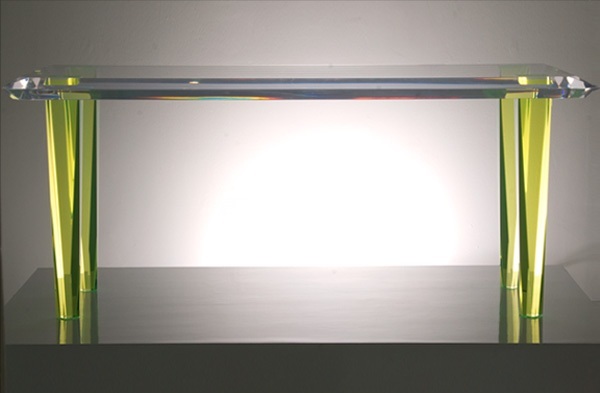 The Axle Acrylic Desk (below) is another fabulous angular creation by Alexandra Von Furstenberg. Inspired by the design of a Lamborghini, the piece can also be used as a vanity table. The glass insert on top is available in an array of colors. Nothing says “office” like a little leather! 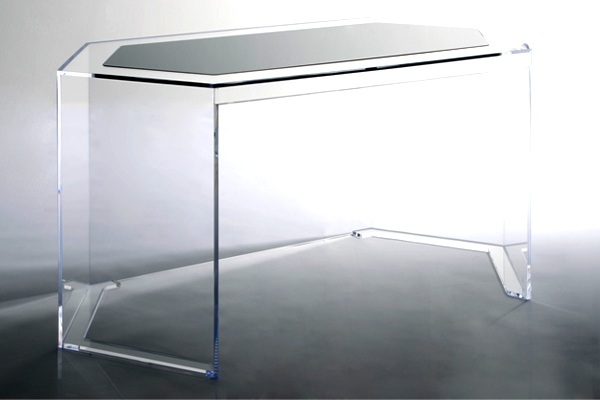 The Leather and Acrylic Desk from Plexi-Craft (below) was designed by Coffinier Ku Design, Ltd. Its leather inset is a powerful contrast to the transparent slabs that surround it. 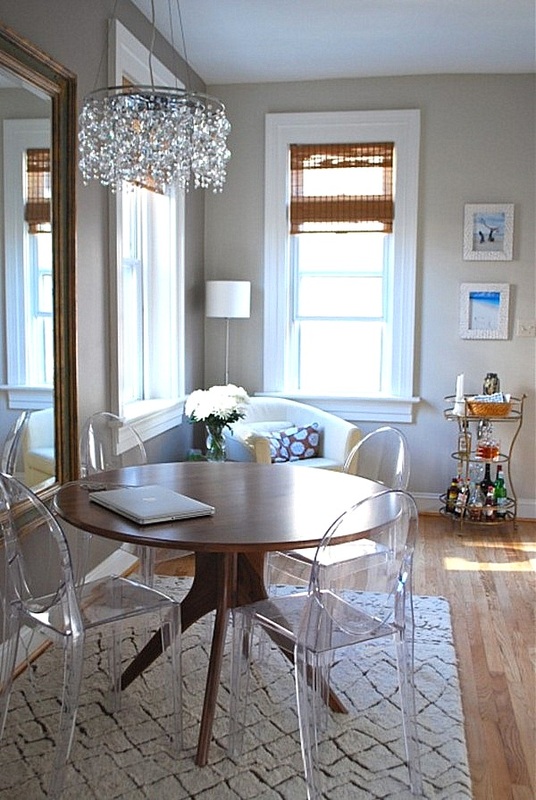 The reverse is also possible–surrounding a clear acrylic table with wooden or metal chairs. 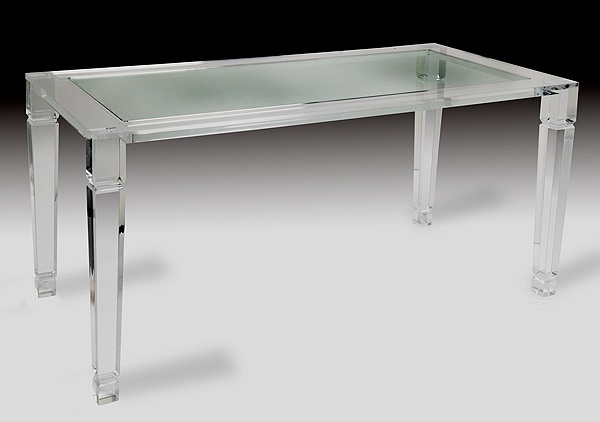 For table shopping options, try the Philipe Acrylic Dining Table from Muniz Plastics. Even with traditional legs, it manages to look modern. A beveled glass top adds character. 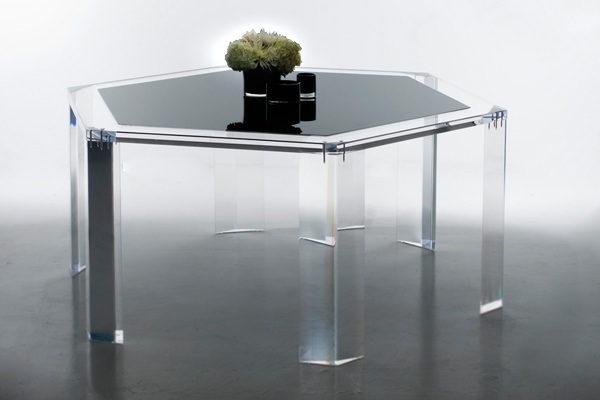 Alexandra Von Furstenberg has done it again with amazing acrylic dining table selections! 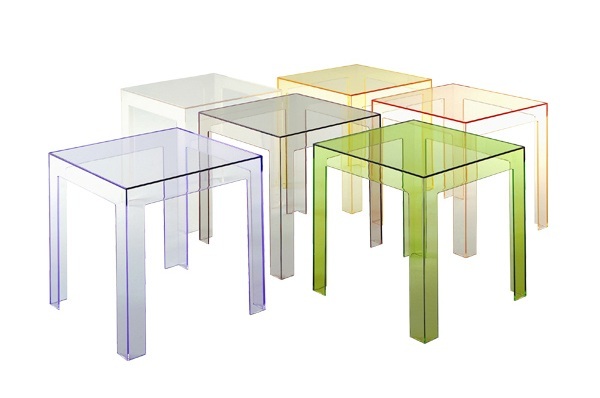 How striking is the Ice Acrylic Dining Table (below) with its range of colorful leg options? This piece is so versatile it can double as a desk or console table. For a hexagonal touch, enjoy Von Furstenberg’s Racketeer Acrylic Dining Table. 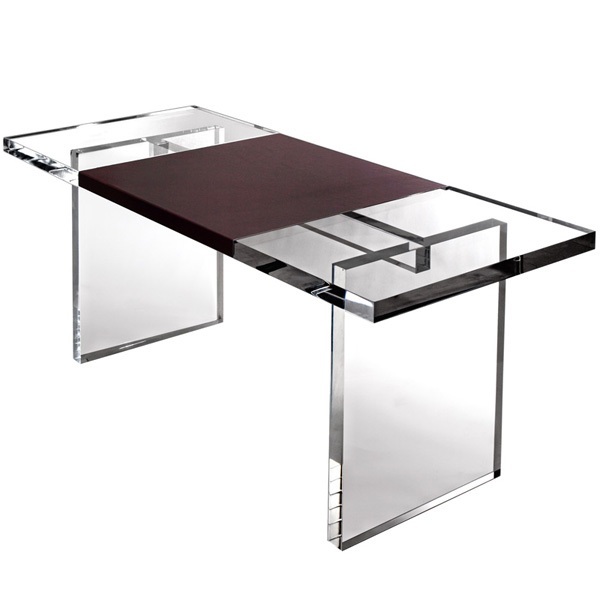 Substantial legs and a mirrored glass tabletop add just the right amount of drama. 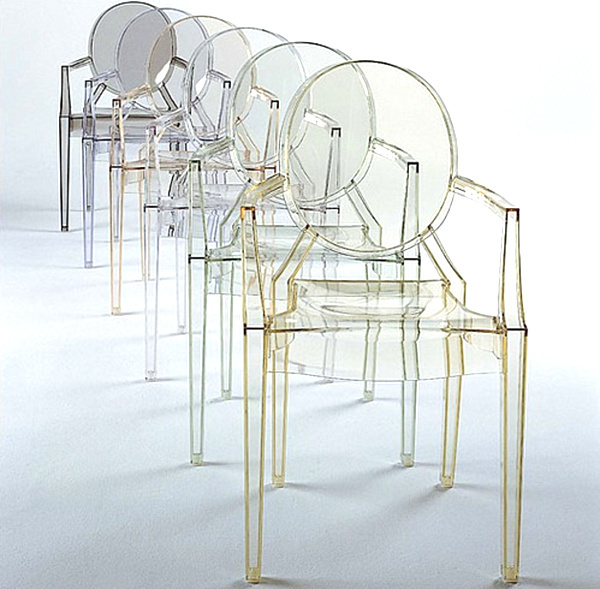 When it comes to clear acrylic chairs, the possibilities are endless! 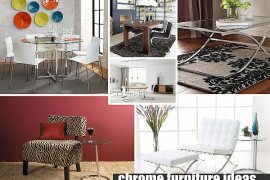 A large, varied selection makes acrylic seating a reality for any home, regardless of design style preferences. 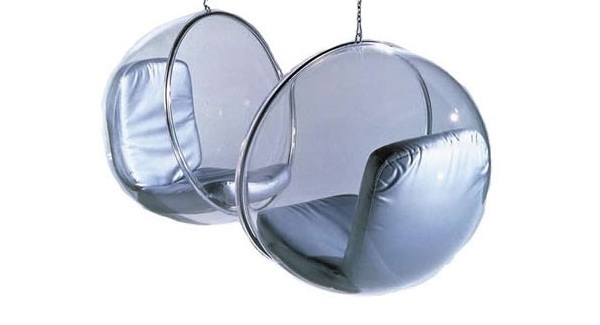 Take these ultra-modern Eero Aarnio Bubble Chairs, available at hive. Their acrylic and steel construction is strongly solid, yet a leather upholstered interior gives them high-quality comfort. The ultra modern Bare Bones Ghost Chair below was previously featured on Decoist, yet we couldn’t resist spotlighting it once again. Its seamless blend of rustic and modern styles make it extremely versatile, but that’s the beauty of combining driftwood with acrylic sheeting! This amazing Etsy find is handmade, so allow 4-6 weeks of crafting time. While the benefits of clear acrylic are undeniable, a wonderful alternative is the highly durable material polycarbonate. 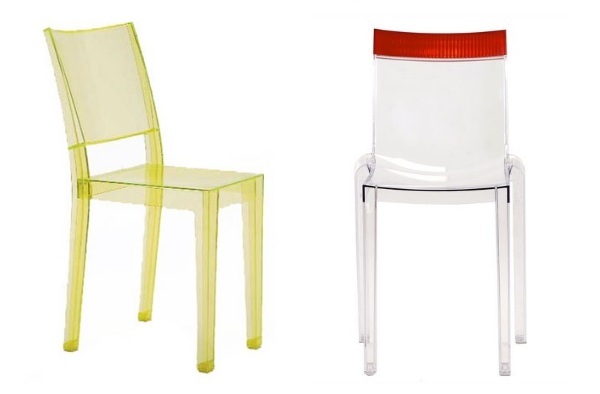 Designed by Patrick Jouin for Kartell, the polycarbonate Thalya Chair has a crisscrossed line pattern across the seat and back.